Sales pipeline management is the process of moving customers and prospects through each stage of your sales pipeline. You can make your process more efficient by taking six key steps to ensure you have clearly defined pipeline stages and actionable tasks at each stage, as well as a plan for measuring and monitoring progress. Sales pipeline management is done best with a CRM tool. Not only can you set up your pipeline stages in your CRM, you can also define required tasks for each stage and track them to ensure they’re complete. You can do all of this quickly and easily with Pipedrive. Click here to start a free 14-day trial today. There are eight pipeline stages every small business should have to ensure the right set of actions take place throughout the sales cycle. Each stage reflects a different level of prospect engagement and lead development while being defined by a unique set of actions. Stage 1: Prospecting – At this stage, you’re identifying and grabbing the attention of members of your target market with the goal of finding out if they’re a viable lead. Stage 2: Qualifying and Managing Leads – This is where you find out if they meet the criteria of being a true potential buyer. Stage 3: Initial Meeting – Once you’ve qualified your leads, schedule an initial meeting to get to know your prospect and their needs. Stage 4: Define Prospect Needs – After the initial meeting, and after you’ve determined your prospect is a great fit for your offering, it’s time to take a deep dive into their needs and pain points, and to determine how your product can help. Stage 5: Make an Offer – Now you’re ready to make an offer. At this stage, use what you’ve learned about your customer and their needs to tailor a proposal that shows how your product offering will meet their needs. Stage 6: Negotiate Terms – Here’s where you finalize the details before closing your deal. If your proposal shows how you can meet your prospect’s needs, this stage would ideally be for making minor tweaks to the proposal. Stage 7: Close Deal – At this stage, contracts are signed, purchase orders are issued, and invoices are paid. Stage 8: Deliver Product (or Service) – Here is where you deliver the product or service and really wow your customer. Depending on your offering, there may be opportunities for upsells, cross-sells, expansion of the offering they just purchased, and referrals. For a more detailed breakdown, visit our article explaining the eight pipeline stages. An important part of sales pipeline management is identifying the tasks that must be completed within each stage. Sales pipeline stages can only progress after certain tasks are performed. For instance, in the prospecting stage, required tasks include networking, social selling, cold outreach, and lead generation. Completion of these tasks builds your pool of prospects, which allows you to move on to the qualifying and managing leads stage. Each stage should include at least one required task that must be completed before a deal can move on to the next stage. The goal of these required tasks should be to increase engagement or a sense of buy-in and forward momentum with the prospect. A CRM like Pipedrive can assist with setting up sales pipeline stages with associated tasks that salespeople must carry out. Pipedrive offers tools to remind you of these tasks and track their effectiveness. For more information on how Pipedrive can help you with your sales pipeline, sign up today to try it for free. Once you’ve established the required tasks for each sales pipeline stage, you’ll need to create rules to ensure these tasks are carried out. Sales pipeline progression rules are necessary for sales pipeline management because they help ensure critical tasks aren’t skipped during the sales cycle. This also helps keep opportunities moving in a positive direction until they are ready to close. From Prospecting to Lead Qualification Stage – Once prospect information is collected, load it into a database or CRM software. After the information is loaded, progress to Lead Qualification Stage. From Lead Qualification to Initial Meeting – To progress to the Initial Meeting stage, confirm roles, titles, and relationships of leads. Then, identify all decision-makers and influencers, confirm available budget for the product/project, and confirm customer needs match product offering. From Define Customer Needs to Make an Offer – In order to progress from defining customer needs to making an offer, a customer assessment must be completed before creating a proposal or making an offer. Setting up rules helps to ensure nothing is forgotten. Using a CRM like Pipedrive (which we’ll discuss below) can help you set up required activities by stage and rules to progress from one pipeline stage to the next. In some CRMs, you can set up sales automation workflows where tasks can be assigned, emails can be sent, activities can be scheduled, and deals can be created automatically based on trigger events. Once you’ve defined your pipeline stages and created rules for sales pipeline progression, you can put your pipeline management plan into practice by setting it up in a tool like a CRM. There are a lot of CRM options on the market, so make sure the one you choose has core sales pipeline management features like the ability to create custom pipelines with tools to help you track sales activities. Custom Sales Pipelines – Make sure your CRM offers the ability to create customized pipelines so you can define as many stages as you need to close your deals. Multiple Sales Pipelines – If your company has more than one sales process, you’ll want a CRM that will allow you to create multiple sales pipelines so that you can create pipeline stages unique to each or your sales processes. Sales Activity Tracking and Management – Because carrying out activities is important in moving prospects along your sales pipeline, you’ll want a CRM that helps you manage and track your sales activities. Sales Automation Tools – If you have repetitive sales tasks that must be done throughout your sales pipeline stages, sales automation tools can help you save time by doing things like sending emails or scheduling meetings automatically. Once you’ve started managing your sales pipeline in a CRM, you’ll want to check your pipeline status and key sales metrics regularly. Some statistics should be tracked daily, like sales activities, and others weekly, like win-loss ratio long term to observe trends. Most CRMs, especially analytical CRMs, allow you to create dashboards with reports and sales statistics. 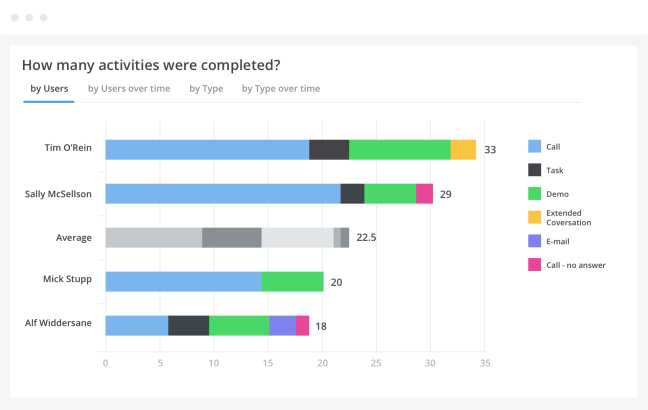 Dashboards let you identify areas that need attention and areas you’re doing well in at a glance. Below are a few key metrics or sales reports you should check regularly. Revenue by Salesperson – This metric tells you how much revenue each salesperson is bringing in, and provides insights on individual strengths and weaknesses or changes taking place in a salesperson’s territory. Sales by Product – The sales by product report lets you compare sales of different products you sell, which can help you determine whether or not to focus on certain products in your portfolio. Win-Loss Ratio – The number of deals you’ve won compared to the number you’ve lost can be helpful for estimating how many deals you must have in the pipeline to end up with your desired number of closed deals. Sales Activities – If there are activities that are necessary but are lacking, this report shows you where you need to focus. Closed Deals – The number of closed deals over a period of time gives you the ability to see seasonality or other trends. Deals Added – You can use this to track whether or not you have enough deals to hit your sales and revenue goals. Lost Deals by Reason – This metric can help you hone in on why your prospects decided not to go with your product, and either make suggestions to change the product, pricing, or your sales approach to minimize the number of deals lost by certain reasons. Lost Deals by Stage – The lost deals by stage lets you know where you are losing deals. For instance, if you’re losing deals after the initial meeting, it may be an indicator that you should work on your rapport building or your presentation. Checking these metrics regularly helps you track the health of your pipelines and stay on top of any issues that need to be addressed before they turn into real issues. It also highlights positive trends, giving you the opportunity to learn why they’re working so you can repeat success. Checking your pipeline status and daily reports isn’t enough. These reports provide valuable information that you must act upon. For instance, as a sales manager, if you notice that one of your salespeople earns significantly more revenue per sale than other members of the team, find out what she or he is doing to maximize revenue per sale. When you’ve found out what they’re doing that others aren’t, build a best or required practice out of it for your team. Quick Visual Snapshot of Pipeline Status – Pipedrive’s kanban-style pipelines give you a quick visual of the health and status of your pipeline. Sales professionals must prioritize activities, and a quick snapshot of tasks that are overdue, coming up, or complete helps them prioritize. Drag-and-Drop Deal Progression – It’s easy to visualize and represent deal progression in Pipedrive. 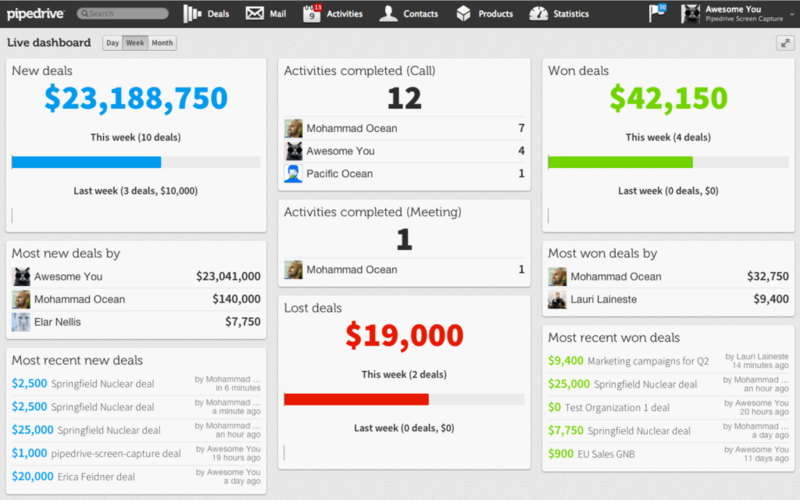 Simply drag and drop kanban boards from one deal stage to the next to update your deal stages. Easy to Read Metrics and Dashboards – Pipedrive offers easy to read metrics you’ll need for sales pipeline management. You’re able to create a dashboard from the reports and metrics most important to your business. Sales Automation Tools – For those repetitive tasks that must occur to progress your deals, Pipedrive helps you save time with sales automation tools. 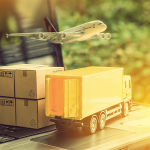 Reminders and Notifications – It’s easy to set up reminders and notifications to remind you to perform key tasks or notify deal stakeholders that a deal has changed stages so they can take appropriate action to keep things moving. Task Management – Pipedrive’s task management tools help schedule and execute key tasks required to keep deals moving through the sales pipeline. Contact and Account Management – Contact and account management tools in Pipedrive help you keep individuals and organizations organized in one place. Tools like contact enrichment offer an automated way to gather additional intel from the web without hours of manual research. Affordably Priced – For such a robust tool, it’s hard to beat Pipedrive’s pricing, which ranges from $12.50 to $49.17 per user per month. Sales pipeline management is the process of moving customers and prospects through each stage of your sales pipeline. A sales pipeline is created by defining your sales cycle and dividing it into stages. Once the stages are created, sales activities that must be completed within each stage are defined. Why Use a CRM for Sales Pipeline Management? Using a CRM for sales pipeline management makes the process easier and more productive. Reminders and sales automation tools help to ensure key tasks are complete in the most efficient way, thus helping to make sure deals stay on track. Sales pipeline management helps manage activities within the sales process to close more deals. Following the six key steps for sales pipeline management outlined in this article will allow you to maximize the number of sales coming from your sales pipeline. Using a CRM to help manage sales pipelines is more productive and offers more insights than using spreadsheets to track sales tasks. Pipedrive is a CRM that makes sales pipeline management easier with visual, kanban-style, drag-and-drop pipelines, and sale metrics. Try Pipedrive’s sales pipeline management tools today with a free trial.